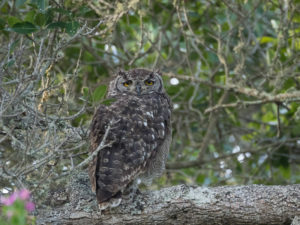 This Spotted Eagle Owl can often be seen perched on the branches of the milkwood trees near the tennis courts. This well camouflaged owl hunts at night it has very acute hearing, enabling it to pinpoint the tiniest sound. The shape of its face acts like a ‘radar dish’ guiding sounds into its ear openings on the sides of its head. and feathers, the flight of the Spotted Eagle-Owl is almost silent, which helps it to catch unsuspecting prey. 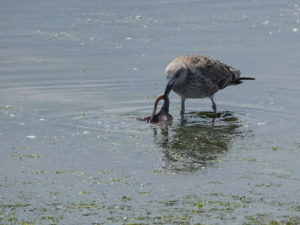 This young Cape Gull was spotted at low tide eating a squid near the tow path entrance before being chased away by its elder!! These scavengers of the sea mostly feed on dead fish and animal matter while sometimes stealing food from other gulls/birds or robbing other bird nest’s for eggs and nestlings. Gulls do sometimes eat molluscs (shellfish) which they carry up to a height and then drop on rocks to break the shell. Gulls are equipped with unhinging jaws which allow them to consume large prey.